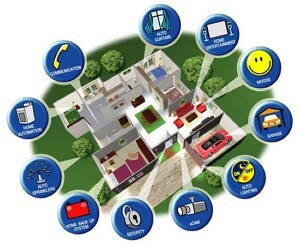 Are Smart Houses the Next Step in Future Technology? As we roll into 2014, it’s fascinating to look back at the last few years and reflect on the incredible technological advances that our world has contributed in the last few years. Our age is perhaps the most innovative in history and the fields of science and computers have been growing exponentially. Just the last 13 years have brought the astonishing developments of everything from iPods and HD TVs to YouTube and Facebook, not to mention smart phones, tablets, and Hybrid cars! In a time where you can access the internet from a device that fits in your pocket, you have probably asked yourself, “What’s next?” There is a lot of remarkable new technology and advancement of current products coming in the next year. As well as talk about Google Glass, Smart Watches, and cars that can drive themselves; some of the most cutting-edge contraptions that will be improved and enhanced in 2014 are “Smart Houses”. A smart house is an extremely environmentally-friendly house that is programmed so that many of its systems can be controlled wirelessly from a smartphone or tablet. This concept has been around for a while, but with the coming innovations you will be able to remotely control appliances, locks, sprinkler systems, HVAC units, pool heaters, and security systems just to name a few! This system can even turn on lights, adjust the thermostat, and open your garage door when you pass a certain pre-determined location. Currently, these more advanced smart houses are fairly costly, but it is predicted that increased demand for them in 2014 will substantially lower the prices. This could really be the future of Real Estate! So keep an eye out in the coming year for new technology and affordability for these incredibly comfortable, environmental, and convenient dwellings. But in the meantime, if you are searching for a more conventional place to live, be sure to visit http://www.songrealestate.com/ and search our complete index of home listings in Lane County!